The BunnServe 24500.0760 installation service sends a technician to your location to install your Bunn JDF-2S or JDF-4S juice dispensing unit. Since a factory-trained technician comes to your establishment, you can rest assured that it will be installed properly. This program can be used by schools, offices, restaurants, and more but large facilities like airports and stadiums are ineligible. There are certain site requirements that must be met before the technician arrives, including local utility codes must be met, a water connection and electrical outlet need to be within reach, and modifications to existing counters and cabinets should be completed. If these requirements are not met, there is a $125 additional fee charged. 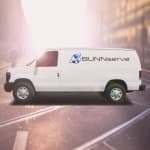 The BunnServe 24500.0760 installation service can be set up any time Monday through Friday from 8 a.m. to 4:30 p.m. local time. If the site does not meet the requirements, an additional $125 fee will be charged.